Designed exclusively for Ducks Unlimited! Each year since 2000, Jett Brunet has carved a new miniature decoy exclusively for Ducks Unlimited. Brunet, one of the world's most distinguished waterfowl carvers, won his first world championship at the age of 21. 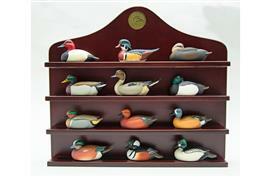 Each classic decoy has been masterfully carved in perfect detail and precise color. The 12 decoys you will receive are the Canvasback, Wood Duck, Black Duck, Mallard, Pintail, Greater Scaup, Green-winged Teal, Cinnamon Teal, Blue-winged Teal and American Wigeon, Hooded Merganser and Goldeneye. Each decoy is valued at $35. The four-tier 16"W x 11" shelf features a special groove for safely holding the keel of your decoys. There are also two hooks on the back if you prefer to hang your shelf and decoys on the wall. This beautiful shelf in a cherry finish features a bronze medallion with the Ducks Unlimited logo. 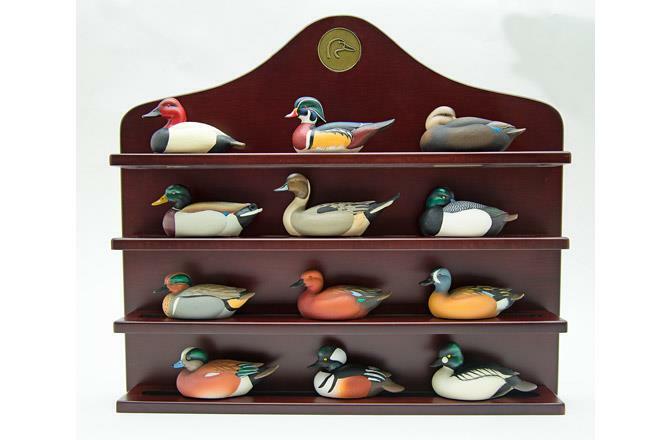 This decoy collection will make a wonderful gift for family and friends! And it can be yours with a tax-deductible donation of $300 or more. Thank you for your support of DU's wetlands conservation mission! If you would like to receive multiple decoy collections or pay for special shipping, please call us toll-free at 1.800.45.DUCKS.